Three-quarters of a century old and with forty years of publishing behind him, Arif Ali is an extraordinary man. He was born in Guyana in 1935. Two of his grandparents were Indian indentured labourers. In 1957, he came to England to study, but ended up educating himself. By the 1980s, he was publishing three weekly newspapers and two monthly magazines, employing a total of 140 staff. The circulation of the weekly Caribbean Times peaked at 28,000, averaging around 10,000. In all his publications, Arif was reaching a readership of about half a million people. 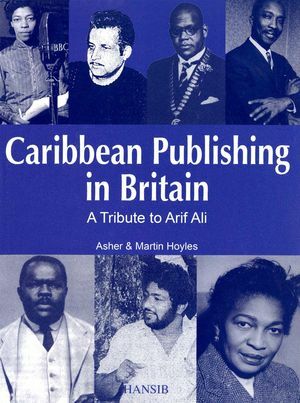 He also published books and Hansib Publications is still the biggest and most diverse Black book publisher in Britain.This book traces the tradition of Caribbean publishing in Britain, starting in the nineteenth century with the revolutionary Jamaican Robert Wedderburn, Celestine Edwards from Dominica who published Lux and Fraternity, and the Trinidadian barrister Henry Sylvester Williams. From the first half of the twentieth century, it records the work of the two Jamaicans Harold Moody (The Keys) and Marcus Garvey (Black Man), and also Ras T. Makonnen from Guyana. After the Second World War, two key publishers were Claudia Jones from Trinidad with the West Indian Gazette and Edward Scobie from Dominica who produced Tropic and Flamingo.The second part of the book describes Arif’s native country Guyana, from its original inhabitants the Amerindians, through colonialism, slavery and indentured labour to independence. From a series of interviews, the third section records Arif’s background and achievements in publishing and applauds his reputation for anti-racist campaigning and community activity, which is second to none.